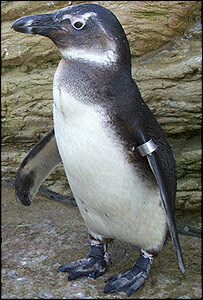 Zoo staff are "anxious" about a baby Jackass penguin which was stolen by burglars at a zoo. Toga, who is brown and white - having not yet reached his adult colouring - was snatched from Amazon World between Newport and Sandown, Isle of Wight. Born in September, Toga lives on a special diet and needs to be kept cool, with access to plenty of fresh water. Keepers say he needs to be with his mother and will not take food from humans. He can survive for five days. Katherine Bright, manager at Amazon World, said: "Toga was last seen at 4.30pm on Saturday. "If he is not found quickly he will die as he relies on his parents for food. "Someone must know of his whereabouts and our main priority is to have the baby returned as soon as possible." Toga was the first South African Jackass Penguin to be bred at the island zoo - including his parents, there are now only six adults left. There are about 150-200 of the rare and endangered breed in the UK. Ms Bright added: "Toga will start to become very ill after about five days without food. "We feed his parents marine fish containing salt tablets and vitamins, which they regurgitate and then feed to him." A police spokesman said: "If you have knowledge of the whereabouts of Toga, the penguin, ring Amazon World and zoo staff will come and collect him." It is thought the thieves climbed over a six-foot outer wall before clambering over an eight-foot metal and concrete barrier.